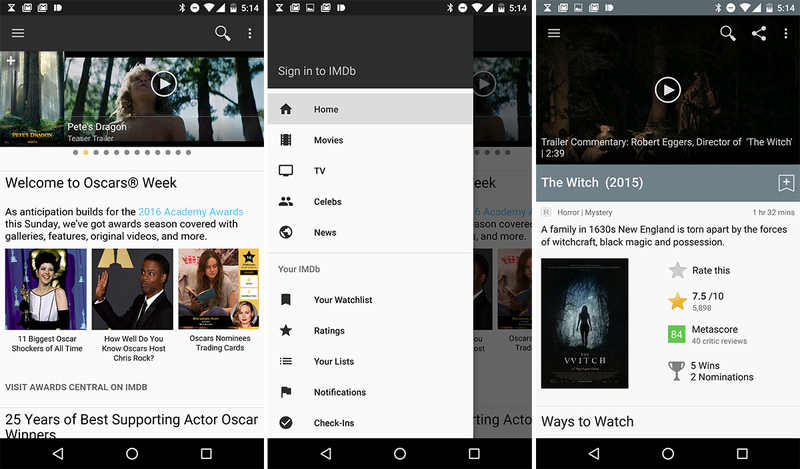 IMDb is a very, very popular app with over 50 million downloads on Android. It's a shame, then, that the app has been behind the curve of Android design for so long. After releasing a redesigned beta last month, the updated version is now available in the Play Store for everyone. It finally brings this app into the material age. The changelog only lists one item—the interface. Material Design updates across the app, including the Action Bar, the Navigation Drawer, and consistent and modern text appearance. When last we saw this update, it was a vast improvement over the old version, but there were still some bugs. This version seems more stable, but it doesn't look any different as far as I can tell. Some of the menus and buttons look a bit off to me, and you still can't cast videos. But hey, it's better than nothing.